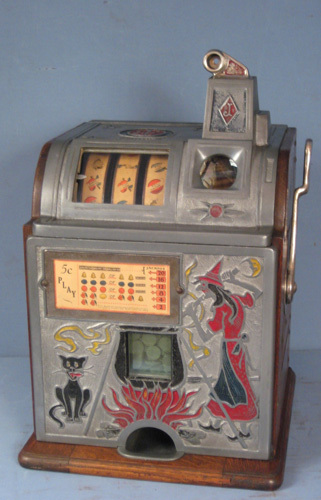 CoinOpCollectorForum.com • View topic - Watling 1c Treasury Slot Machine Reproduction? Watling 1c Treasury Slot Machine Reproduction? Hi. Totally new to this but I bought a Watling Treasury 1c slot machine today. Now, how can I tell if it's a reproduction? (Never crossed my mind when I bought it!) thanks. Re: Watling 1c Treasury Slot Machine Reproduction? Can you provide a photo? Did you buy it on eBay? If so, what is the listing number? Found it at a yard sale. Don't have any pics yet. Was hoping there were major things I could check? More than one phoney version exists, need pictures. There are no mech pictures but my guess is you have an original early American coin front Treasury. Someone has done an incorrect restoration on it but that can be redone. The slide in back of the goose neck is even the correct one for a Treasury. Thank you for the info. It didn't come with a key, but I shall call a locksmith first thing in the morning. Anyone recommend the best way to have it appraised? Or should I have it restored first? Sorry for all the questions, but I know absolutely nothing about this type of collecting. The first thing and I feel most important it that you never leave your machine with "ANYONE" locksmiths included. 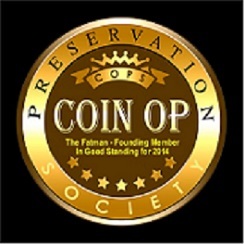 They will remove old coins and tell you it was empty. Dont let anyone talk you into leaving your machine with them to restore until you know them, where they live and have a few references about them. I have heard too many stories of new collectors giving their machine to someone to restore and if they were lucky to get it back, it usually had original parts removed and replace with retro or re-manufactured parts. There is plenty of excellent help for you here to talk k you thru any problem you might have.